Most peoples' lives contain at least one significant turning point. Mine came in 1995 - on my 32nd birthday - when I moved to France to join my wife, Alice, who had found a job at the University of Savoie in Chambéry. For the previous fourteen years, my love for the outdoors had found its outlet almost exclusively in rock-climbing, mostly in the UK. The change of address very quickly led to a change of focus with, at first, mountain biking, and then ski touring and road cycling taking up ever greater amounts of my free time. With the whole of the French Alps on my doorstep, I had a whole new playground to explore and, working as an English teacher, I had the time to make the best of it. Over the last ten years, I have come to know many of the Alpine massifs extremely well but, at the same time, I feel I have hardly scratched the surface of what my adopted home has to offer. 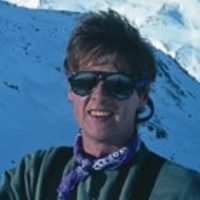 The guides I have put together for Cicerone were motivated by a desire to share the joy I have found ski touring and cycling in the French Alps.